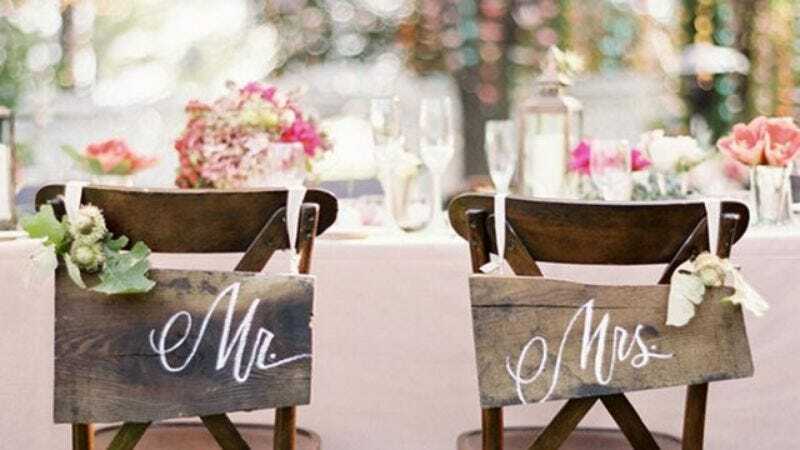 Thinking about having a nontraditional wedding, but not sure if you’re ready to take the plunge? Try out some of these totally offbeat ideas we’ve heard about and make your wedding a day no one will forget. 1. Make your wedding all about you: Why invite a bunch of worthless guests when it’s supposed to be your day? Get married in front of row after row of mannequins that look like you, and play videos of you saying how beautiful you look. 2. Bride made entirely of mason jars: For an elegant DIY touch, consider using a bride constructed head to toe from mason jars. 3. Cards: Assign every wedding guest a playing card according to their personality. For example, if there’s a guest you consider a “queen of hearts,” they are the Queen of Hearts, and so on. Don’t tell anyone who’s assigned what, or that you assigned them cards at all. Keep the assignments to yourself and just think about them every once in a while. 4. Use the event primarily to promote The Hunger Games: Mockingjay, Part 1: One fun idea is to use the wedding primarily as a venue to distribute promotional materials for the new Hunger Games film. Having a theme like this one can really tie a wedding together! 5. Cliffs, cliffs, cliffs! : Cliffs are in right now, so make sure to get married on a cliff and snap up one of those in-demand cliff preachers (if you can!). 6. Jacked flower girl: Traditional flower girls are cute, but if you really want to leave a lasting impression, opt for one who is exponentially more powerful and muscular, one who doesn’t so much as toss the flower petals but rather smashes them into a fine mist of pollen with her tiny hulking fists. 7. Quietly ask around for a doctor: While the groom’s waiting at the altar for the bride to walk in, have an usher quietly go around asking if there’s a doctor present. It’ll keep your guests on the edge of their seats! 8. Let the guys keep their skateboards: Sure, it’s tradition for all men to leave their skateboards at the chapel doors before entering for the ceremony, but who says you can’t buck tradition a little bit? Let the boys keep their boards inside so they can skate up and down the aisles! 9. Gay wedding: Having a gay wedding is increasingly trendy. Consider having a gay wedding! 10. Aisle is an endless labyrinth: The emotional peak of any wedding ceremony is when the bride walks down the aisle, so why not prolong this special moment by having the bride navigate an endlessly complex labyrinth in order to reach her beloved? It’ll make your wedding perfect!